Recruit a quirky crew of Thieves and equip them with colorful Gear to steal from fa- mous places across Europe! Prove yourself as the best Thief in Caper. In Caper, players build a crew of Thieves by playing Thief and Gear cards. The game plays across six rounds with each round alternating between placing Thieves and placing Gear. On a Thief Round, players place different Thieves at the Locations out that game. On a Gear Round, players place Gear cards onto their Thieves to increase their influence at a particular Location. After playing a card, play- ers will swap hands—so think twice about letting your opponent have that one card. The crew with the most Capers at a Location will win the steal there and gain its Reward. Some Thieves and Gear also have special Abilities that can help each player obtain Points. Players can also collect different types of Stolen Goods providing Points at the end of the game. Finally, the player whose crew scores the most Points will be the winner. 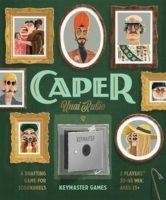 Add a Review for "Caper"